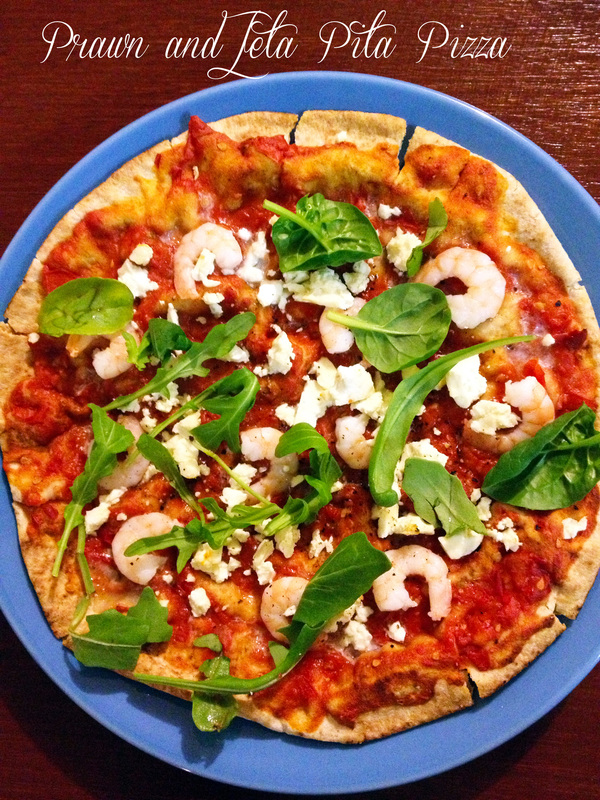 So, why am I posting a recipe for a pizza made on a pita bread – a very non-traditional pizza – you might ask. Well, because when I make pizza I almost always make my own base, and it’s not only time consuming, but messy. The beauty of the pita pizza is it is SO simple, even my boyfriend who dislikes (but tolerates) cooking will make pita pizzas. And it’s much healthier for you than the traditional white or even wholemeal base that I am so fond of. I like to make a few varieties of pita pizzas, but tonight I’ll start with one that I am currently obsessed with because I ALWAYS have these ingredients in the fridge/freezer, pantry and in the veggie patch. Try it and see for yourself! Preheat oven or grill to moderate heat. Spray round pizza trays with olive oil. Spread base with sauce. Sprinkle prawns, chilli if using, garlic, and feta. Bake for 10 minutes or until base is crispy. Serve sprinkled with rocket leaves and freshly cracked pepper. And that’s it! Easy as. The other awesome thing is it has a pretty easy clean-up. Perfect for mid-week dinners. And totally lazy cook friendly! If you want to make your own sauce, here’s what I do. You can either use a food processor (although that makes quite a few extra dishes) or use a mini chopper device if you have one. I have a Tupperware Turbo Chef and it does the trick. Process/finely chop/blitz one clove of garlic, 1/2 fresh red chilli, 2 tbsp tomato paste and a can of diced tomatoes (I use about a handful of cherry tomatoes out of the veggie patch) until thick but still chunky. This should make enough sauce for the two pizza bases, but often I will make double or triple and put it in iddy biddy containers in the freezer. Perfect for nights when I want pizza but don’t want to go fumbling around in the veggie patch with a torch in my pyjamas in the freezing cold night!